Right from the very beginning, Chris and Anne knew exactly what they wanted from their dream kitchen. As a sociable couple, they often entertained friends and relatives at home, cooking and serving up fantastic meals while relaxing and enjoying each other’s company. Up until now, they’d been doing this by ferrying food between two smaller rooms. This meant that for the Redmonds, creating a continuous, family-centric space was an absolute must. While making their decisions between a number of kitchen designers, Chris and Anne decided to pay a visit to Kitchen Design Centre’s local showroom in Colne. 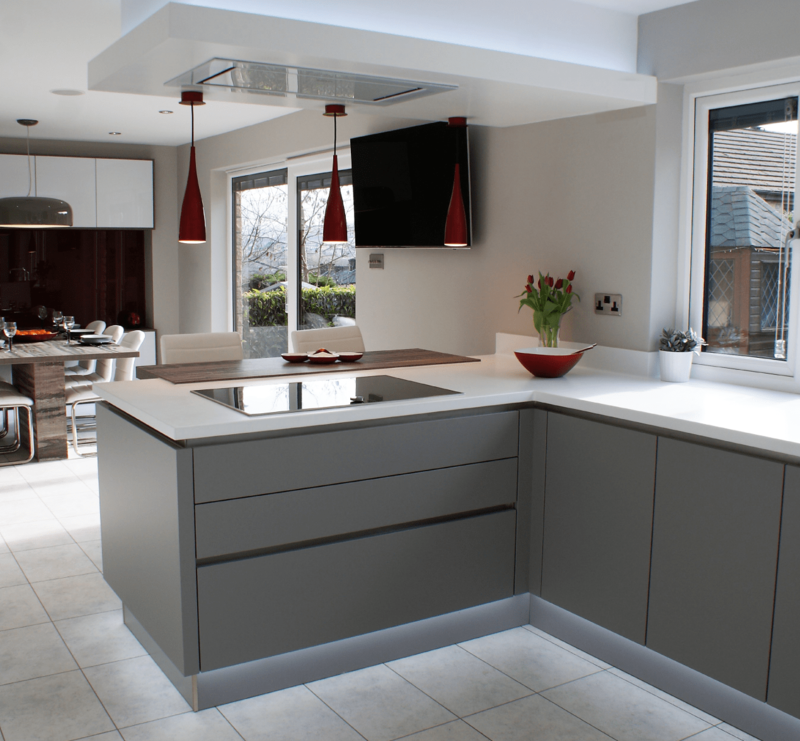 There they were charmed by not just the quality of the designs on offer, but also with the cheerful attitude and fantastic customer care shown by the Kitchen Design Centre staff. Maxine’s first step towards realising the Chris and Anne’s vision of their dream kitchen was to remove the dividing wall between the old kitchen and dining room. At the same time, she blocked up a doorway from the old dining room to the lounge – this not only gave the new kitchen more space to dine and relax, but also gave the lounge itself a lovely cosy feel. 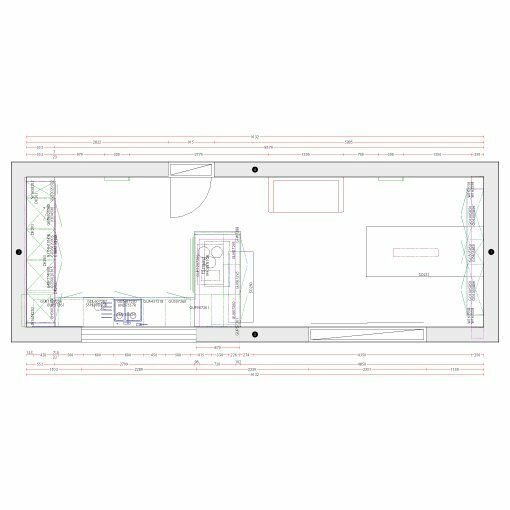 The result was a comfortably large, south-facing space that flows wonderfully from the cooking area to the dining area, all flooded by beautiful natural light. Chris and Anne already had a solid idea of what sort of appliances they wanted for their dream kitchen, having attended one of Kitchen Design Centre’s very popular Cookery Demonstrations. Maxine was on hand to provide some much-welcomed guidance on the specifics, helping the Redmonds to outfit their kitchen with a stunning array of hi-tech appliances. 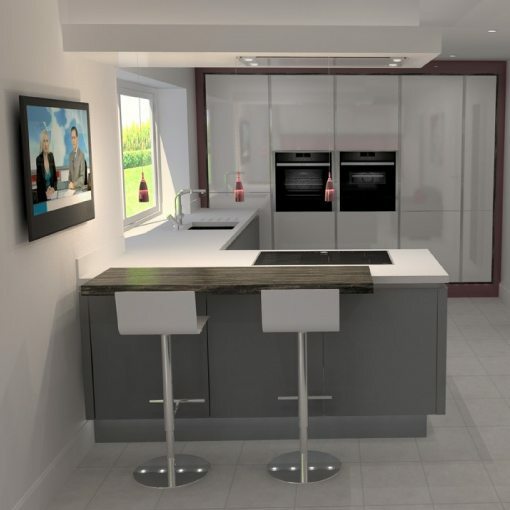 These included a Slide and Hide steam oven, a combination oven, a flex induction hob, a warming drawer and a fridge freezer, all from industry-leading supplier Neff. Meanwhile, innovative twin Quooker taps provide boiling hot water at an moment’s notice, and a Faber extractor above funnels out any lingering cooking smells. The finished kitchen looks resplendent in a colour palette of gloss grey and white, but with some fascinatingly subtle edges. Expressing a fondness for the colour red, Chris and Anne specifically asked for it be woven into the design, and Maxine delighted in using her creative talents to do so. 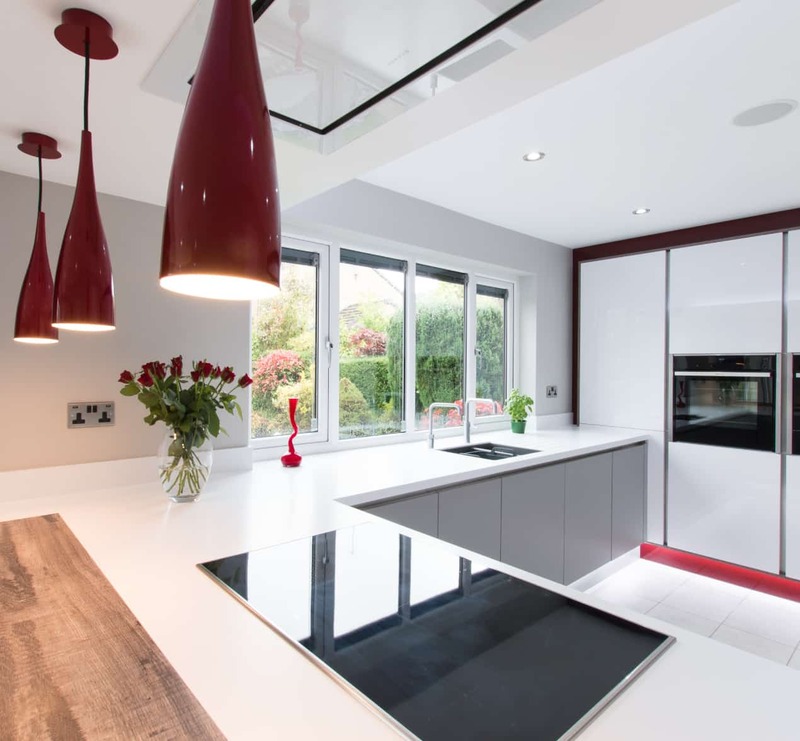 The designer white Corian worktops were her idea, seamlessly melding into the kitchen’s stunningly clean aesthetic. 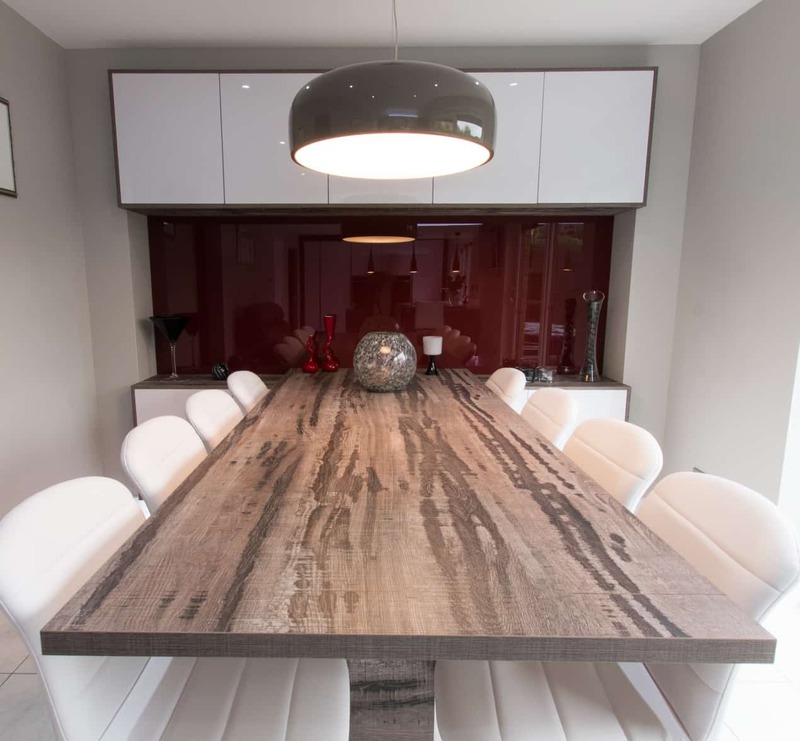 Their pure white shades are offset by a statement Barrique oak breakfast bar, its sumptuous dark hue complemented by the Lacobel red glass lights hanging above, in keeping with the Redmonds’ request. 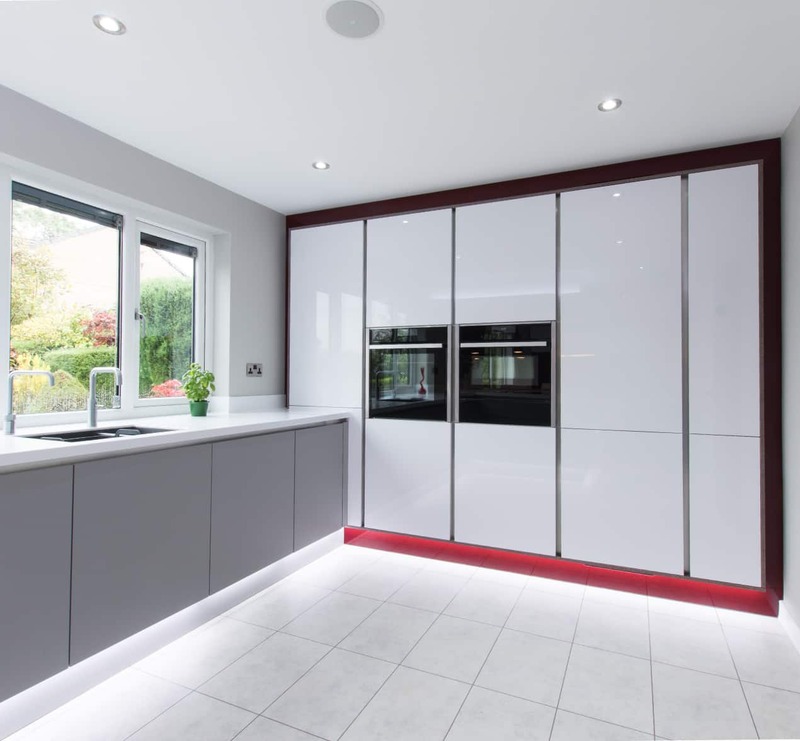 This attention to detail is mirrored in the tall units which house the oven, blending into the design in polar white gloss. They’re once again framed by red Lacobel glass, while matching Barrique oak panels give an understated dramatic effect to the overall design. Incorporating all these different elements posed a exciting challenge for Maxine, who had to plan how to blend them together into a single space without anything clashing. The question is, what did Chris and Anne think of the final results? 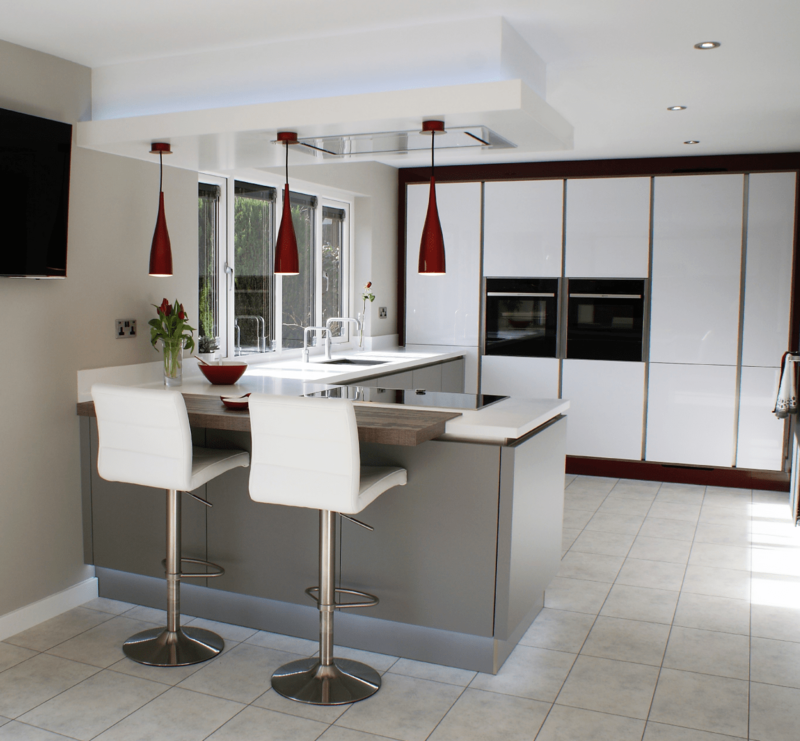 "Kitchen Design Centre were first class in every aspect, from the initial design right through to completion. We’d wholly recommend them!" 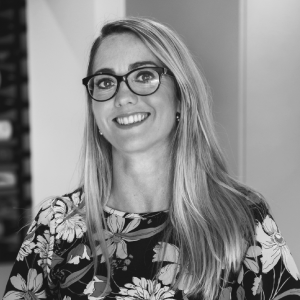 "I loved working with Chris and Anne, and I spent a lot of time in our initial meetings getting to know them. 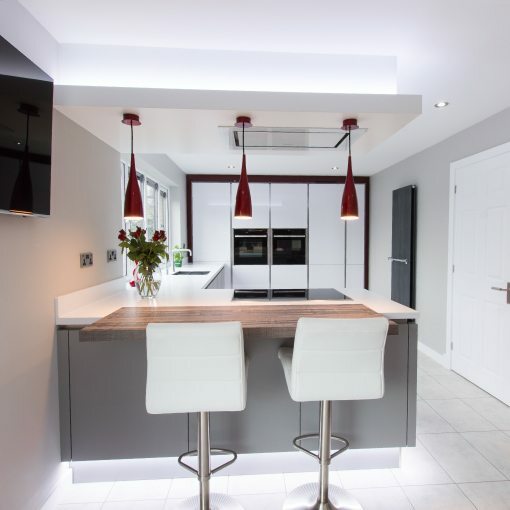 These conversations were a great help in the design process, helping me to create a stunning kitchen that’s designed to fit their lifestyle exactly, and make it a room they can enjoy with family and friends for years to come"